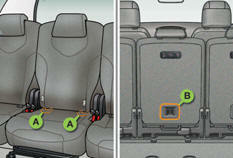 Your vehicle has been approved in accordance with the new ISOFIX regulation . - a ring B , located behind the seat, referred to as the TOP TETHER for fixing the upper strap. This ISOFIX mounting system ensures fast, reliable and safe fitting of the child seat in your vehicle. The ISOFIX child seats are fitted with two locks which are secured easily on the two rings A . Some also have an upper strap (or top tether) which is attached to ring B . 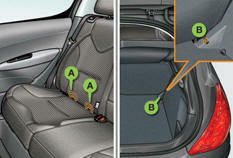 To attach this strap, raise the vehicle seat's head restraint then pass the hook between its rods. Then fi x the hook on ring B and tighten the upper strap. 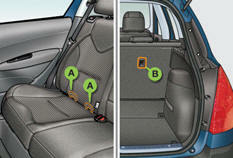 The incorrect installation of a child seat in a vehicle compromises the child's protection in the event of an accident. For information regarding the ISOFIX child seats which can be installed in your vehicle, consult the summary table for the location of the ISOFIX child seats.